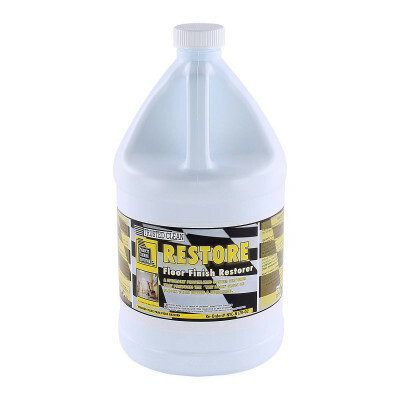 Trusted Clean Restore is a floor buffing finish restorer solution, and multi-purpose companion product for any high speed floor maintenance program. You can use it as a mop-on floor finish restorer in high speed burnishing programs, or use as a spray buff compound in traditional spray buffing procedures. This restorer brings back the 'wet look' appearance of the floor and extends time between stripping and re-coating. Saves time and labor. Versatile and easy to use. Compatible with all quality floor finishes. Remove all debris and loose soil with a dry mop or broom. Daily maintenance of dry mopping and routine scrubbing with neutral cleaning detergent is recommended. Dilute 1 part Restore with 2 parts water. Use conventional spraying methods and apply a fine mist in front of your burnisher/buffer. If working on an area that is excessively soiled, a neutral cleaner should be used, and the area damp mopped. Dilute 1 part Restore with 5 parts of water. Damp mop surface and let dry. This area may be burnished with a high speed electric burnisher immediately after it dries. A quality high speed polishing pad is recommended. Customers who were interested in the Trusted Clean 'Restore' Floor Finish Restorer - 2 Gallons were also interested in the following items. I've tried other spray buff solutions and none leave the glossy shine that restore does. Plus you can't beat the price. I ran or of this burnishing chemical and tried another that was local. Got complaints of lack in shine. Immediately logged back in and ordered more. This is my go to burnish chemical now. Great product for floors, make it clean and shinny. I would recommend this product to everyone. Also this product was shipped very fast. This is a review for the Trusted Clean 'Restore' Floor Finish Restorer - 2 Gallons.